The same SolarForce® on the outside, but all new power and design on the inside! 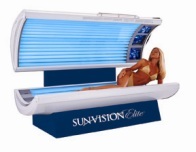 Now the 652V features 180 watt 2 meter lamps to boost the power, results and overall tanning experience. The 9-minute head-to-toe tan is perfect for your busy clients.